The ever-changing gameboard for Zark City is made up of playing cards and is created during the game by the players. 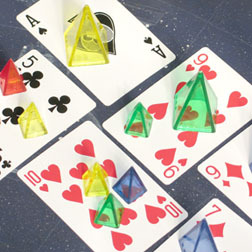 Icehouse pyramids are used to indicate who's in control of which cards. The goal is to completely control a connected trio of three cards which are either Three-of-a-Kind or which form a three-card Straight Flush. Zark City Version 2 is now available! Obsolete Version 1 rules are still online, in English and Spanish. Andy's WWN article about the creation of the game: Welcome to Zark City!